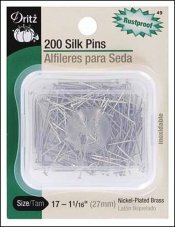 Silk Pins, Size 17, pack of 200  - $4.00 : Yarn Tree, Your wholesale source for cross stitch supplies. Item 8382. Silk Pins in a pack of 200 size 17 silk pins. 1 1/16" long. Rustproof, nickel-plated brass. Use for silk and synthetic fabrics. Also great to use for framing to insert into the edges of the mounting board.